We recently launched a premium WordPress plugin called, SkyStats. SkyStats provides an alternative WordPress dashboard that creates a mashboard of marketing analytics data. One of our first tasks was to create a freemium version of the plugin and get it listed on the WordPress Plugin Directory. We felt that the directory would provide us the initial exposure to help create some initial buzz about the plugin. So I was tasked with how we should optimize the listing to ensure maximum exposure for our plugin within the WordPress Plugin Directory search results. Upon our journey to launching SkyStats we have found that there is not a lot of information in regards to optimizing a WordPress Plugin Directory listing. This probably stems from the fact that the majority of plugin authors are developers and not experts in search engine optimization techniques. So over the last several weeks I have performed some analysis on how to properly rank a plugin in the WordPress Plugin Directory. I am going to explain three misconceptions that plugin authors may have in regards to effectively optimizing a WordPress Plugin Directory listing. Will adding a whole bunch of tags to describe your plugin help you rank for those keywords? I tested this theory by adding a nonsense keyword as a tag to our plugin. I checked that there were no other plugins that referenced this tag nor had it in any of their content. What I found was that the search feature in the directory defaults to searching by “keyword”. So when using our nonsense keyword as the search criteria, the directory displayed no results. I had to search by the “tag” option in the search feature in order for our plugin to show up in the search results. Most people are not searching by tag, but rather by keyword. This is not to say that you should dismiss adding tags to your listing. There is opportunities for users to explore the tag list on other plugin listings and have your plugin show up within the “tag” search results. Thus, giving you a chance for additional exposure. Pro Tip: The WordPress Plugin Guidelines state that you should not try to keyword stuff the tags field. They recommend to include no more than 12 tags. Remember this is a guideline and not a hard limit. The JetPack plugin uses over 50 different tags. Just make sure that they are on topic and relevant for your plugin. Do you have a chance if the top plugins had hundred of thousands or even millions of active installs? 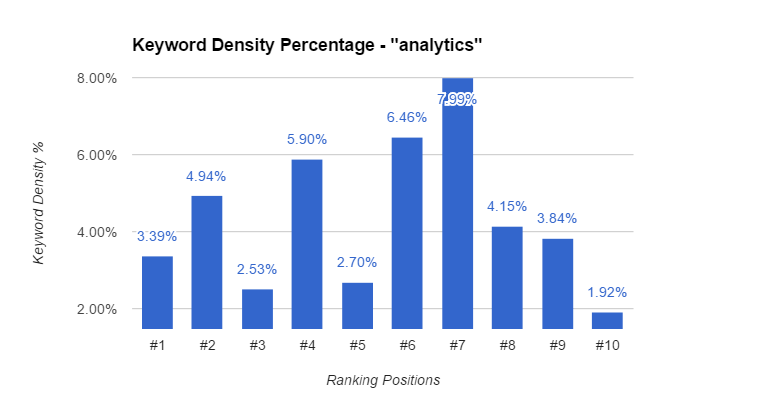 I took a look at several competitive keywords and analyzed whether the number of installs a WordPress plugin had any immediate impact on rankings. One keyword we looked at was “Google Analytics”. There were 722 plugins that came up for this keyword. The popular Google Analytics by Yoast plugin with 1+ million installs and over 9 million downloads was ranked #8 for this keyword. 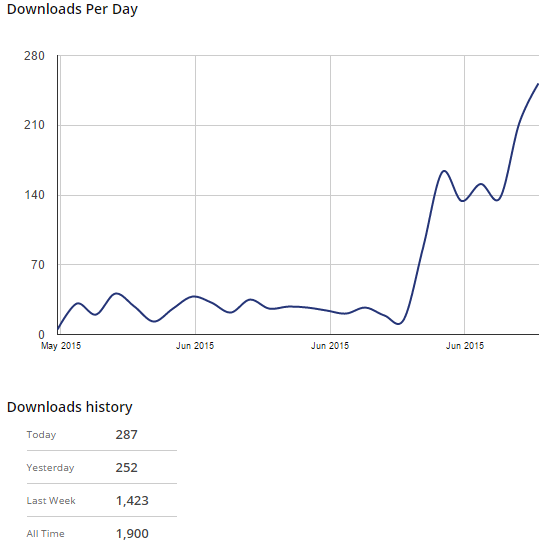 The #2 listing had only a mere 500+ installs and a little over 1900 downloads. What I found by analyzing this search results and many others was that there was no indication that the number of installs directly corresponded to high rankings. Pro Tip: I even analyzed the percentage growth of downloads to see if that was a factor. There was clearly no pattern where a top position had significantly higher percentage growth. There may be a “download velocity factor”, which could explain how the Better Google Analytics plugin was out ranking the Google Analytics by Yoast. I need to dig a bit deeper on this outlier as the Better Google Analytics plugin was recently added to the WordPress Plugin Directory. Keyword density “is the percentage of times a keyword or phrase appears on a web page compared to the total number of words on the page” (Wikipedia). 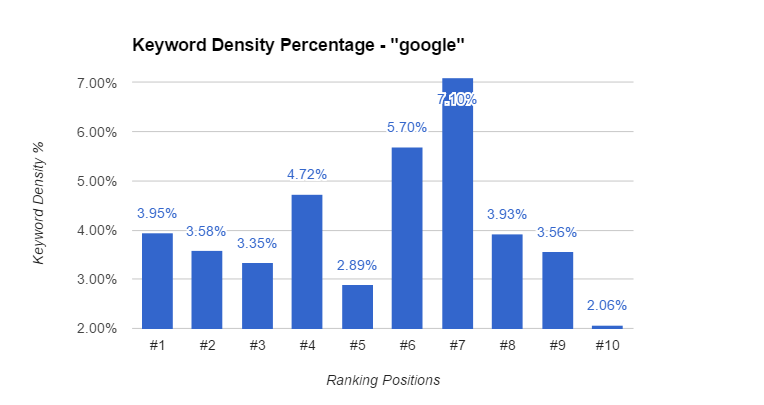 In the SEO world, keyword density used to be correlated with higher rankings. However, that metric started to die in the early 2000’s. 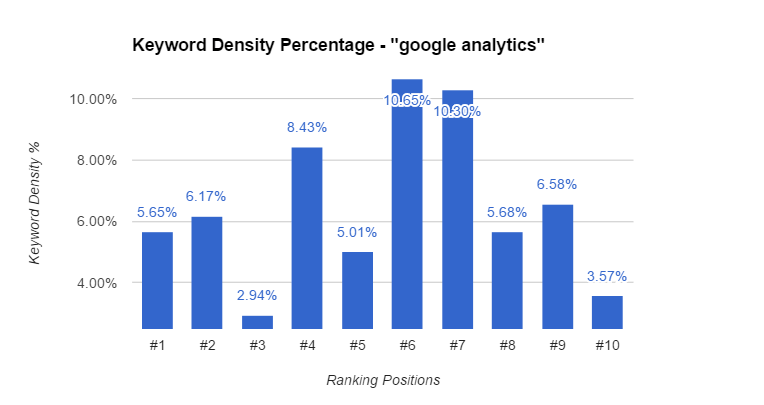 So does keyword density matter when you are trying to rank higher in the WordPress Plugin Directory? I ventured over to a popular keyword density analyzer tool. I took the top ten listings from several keyword searches and entered them into this tool. So for the “Google Analytics” results I looked at the keyword density for “google”, “analytics”, and “google analytics” keywords. The tool provided the number and percentage of times that the particular word / phrase showed up on the page. I found several attempts at keyword stuffing, but no evidence that the number of times or even the keyword density percentage had an impact on the search results. Pro Tip: I found that the biggest factor is actually to have your keyword within the plugin name. You only have 80 characters, so make sure that you use your targeted keyword(s) combined with a brand name. 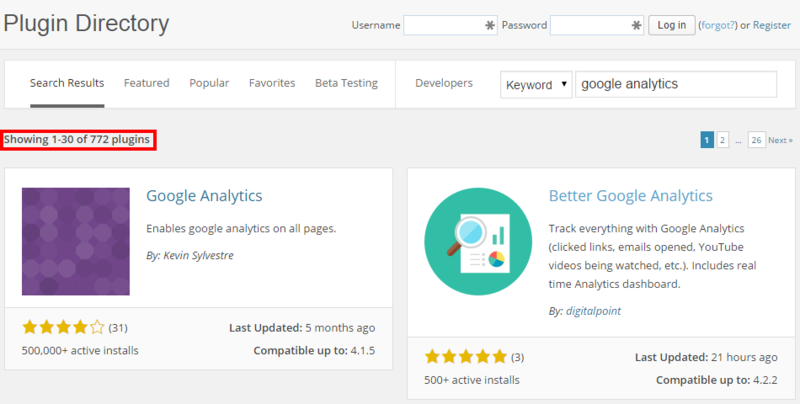 Yoast does a great implementation of this for their Google Analytics by Yoast. In this case, “google analytics” is the targeted term and “Yoast” is the brand name.